If you’re a teacher, retired teacher, grad student, or an expert in math, science, or computer science, you can make extra money working for Tutor.com. 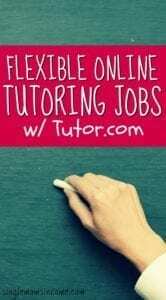 Tutor.com offers online tutors to their students 24 hours a day, 7 days a week, so you can work a flexible schedule. You can work as few as 5 hours per week and as much as 29 hours per week. You can also change your schedule from week-to-week and pick up unscheduled sessions if you find yourself with free time. Best of all, you can work from anywhere you have a stable, high-speed internet connection. Tutor.com offers a mentoring system and resource center to help you be as successful as possible. Tutors are responsible for engaging students in the subject matter and guiding students to understand what they are learning. Many students work with Tutor.com to seek help with homework and subjects they don’t understand. You also need to live in the U.S. or Canada, have a valid Social Security or Social Insurance number, and be available at least five hours per week. You’ll need to go through an application process that includes a competency exam before getting started. The process takes anywhere from one to three weeks to pass and get hired. The first step is the application, then a subject exam, followed by a mock session, and finally a background check. Before getting started, be sure to review their Basic Concepts List to see a full list of subject matters they tutor to see if you will qualify. Once you pass and are hired you’ll be paid a set hourly rate that varies based on the subject. The pay is on a regular schedule and you are paid via direct-deposit. More information about pay range and structure is available once you complete the application and exam. If this sounds like something that interests you, visit Tutor.com’s website to learn more and begin your application process. Tutoring students is an excellent way to earn extra money in your free time while doing something good. 6 Companies that Hire Online Tutors – If you’re looking for more tutoring positions this post has a list of companies that are always looking for online tutors. 50 Legitimate Online Jobs – This list has over 50 legitimate work at home jobs, online business ideas and places where you can earn extra cash.